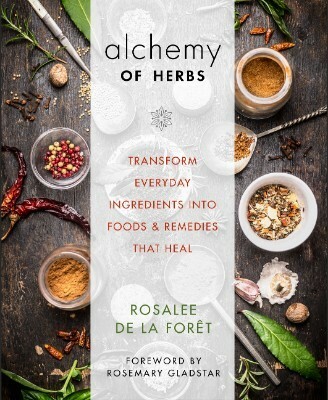 Just as alchemists transform the ordinary into the extraordinary, with this book you can transform everyday herbs and spices into effective healing herbal remedies. Rosalee de la Foret, a clinical herbalist, examines the history and modern-day use of 29 herbs, offering clinical studies to support their healing properties. She also dives into the energetics of herbalism, teaching readers how to match the properties of each plant to their unique needs, for a truly personalized approach to health. The recipes in this book take a variety of forms - from teas and pastilles to beauty products and delicious foods - to show how easy it is to incorporate the healing power of herbs into your everyday life. You could start your day with Spiced Cold Brew Coffee, pamper your skin with Green Tea and Rose Facial Cream, make a meal of Astragalus Bone Broth and Sage Chicken, then treat yourself to Cardamom Chocolate Mousse Cake and a Holy Basil-Ginger Julep. Beautiful photos taken by the author of the herbs and recipes complement each chapter. This book will appeal to those interested in natural health and herbalism, and the recipes offer an easy entry for beginners. Readers will never look at cinnamon, coffee, parsley, lavender or even chocolate the same way again, as they realize the kitchen can be their medicine cabinet!